Compared to the standard FLS door markers, the FLS design door marker is somewhat narrower. The FLS design is ideal for office buildings and public buildings. In the design version, the door markers are attached to the wall surface next to the door frame. The carrier material is freely selectable. Again, the integration of barrier-free elements is taken into account. 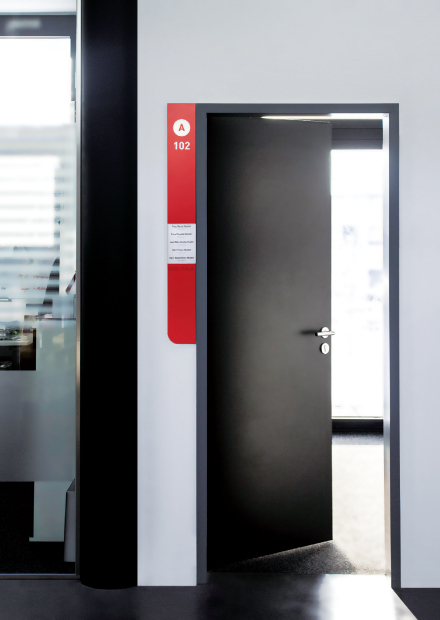 Together with the Schilderfabrik Moedel GmbH from Amberg, we have developed an integrated door tag system, the FLS Standard. This sign has optionally a theft-proof name plate, which is offered at different heights and can be independently labeled by the user. The FLS-specific requirements are maintained, which means that rescue workers, as in the schools, can easily find their bearings. Of course, attention was also paid to the fact that components for accessibility / inclusion can be supplemented later. Tactile writing and braille writing can always be attached to the door signs. Due to the excellent perception of the door signs, they are also clearly visible to people with poor eyesight.